Statutory form and explanatory notes for notice ending a business tenancy on public interest grounds. This notice complies with sections 25 and 57 of the Landlord and Tenant Act 1954. The landlord’s will use this notice to end a business tenancy on public interest grounds. Use this form if you have a section 57 certificate. 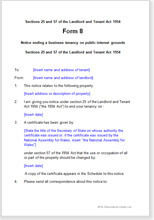 Where the tenant may be entitled to acquire the freehold or an extended lease, use Form 13 in schedule 2 to the Landlord and Tenant Act 1954, Part 2 (Notices) Regulations 2004 instead of this one. You may also like to read more about the process of ending a business tenancy under s25.